The Young and the Restless spoilers indicate that the next several episodes will keep fans at the edge of their seat. The Newman family will get a new threat as Nikki Newman (Melody Thomas Scott) will try to take matters into her own hands. Here’s what you need to know. During the Thursday, February 7th episode Nikki and Victor Newman (Eric Braeden) will work to figure out what their next move will be. They already know that there is someone out there who has infiltrated the Newman ranch and is set to hurt their family. Elsewhere, Sharon Newman (Sharon Case) does her best to comfort Nick Newman (Joshua Morrow) while Kyle tries to defend himself, although he knows that it won’t be easy. During the Friday, February 8thepisode, fans can expect to see a special tribute in honor of actor Kristoff St. John, who passed away on Monday. 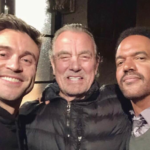 The entire cast and crew of The Young and the Restless is still mourning his loss, as there is no doubt that Neil Winters will be missed, both on and off screen. During the same episode, Nikki will make a decision that will most likely change a lot of things. Nick and Phyllis will struggle with the truth while Abby will work in overtime on some damage control. By next weeks, viewers can expect to see Kyle and Lola go on a double date with Mariah and Tessa. Unfortunately, a “third wheel” will appear, so to speak. Summer will stir some trouble when she gets in the middle of things between Kyle and Lola. Victor will also uncover something shocking as he too is now worried about his own future. Of course, fans will have to tune in to find out what will happen next! In the meantime, drop us a line with your thoughts in our comments section below. Tell us, what do you think is next for your favorite characters in Genoa City? The Young and the Restless airs weekdays on the CBS network. Check your local listings for times. And as always, come back to Daily Soap Dish for all the latest news, updates and spoilers on The Young and the Restless and all of your favorite daytime television shows right here!